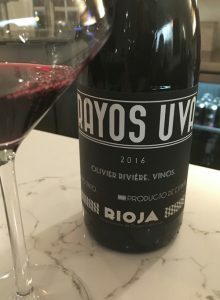 2016 Olivier Riviere, Rioja “Rayos Uva” Vino Tinto, Spain. Rioja’s newest star is a French transplant, Olivier Riviere, born just south of Bordeaux in the Cognac region, he’s studied in Saint-Emilion and made wine at top estates in France, including stints at biodynamic producers like Elian da Ros, a unique wine/winery of which I first tried a few years ago, as well as Domaine Leroy, the famous Burgundy! After a deal to open his winery in the south of France in Fitou fell through Riviere went to Spain, first to help Telmo Rodriguez of Remelluri convert to biodynamic, and now is a rising talent in Rioja with many organic parcels spread throughout the zone. His wines have caught the attention of critics far and wide for the ease of use, value and transparency of fruit, these are not showboats, but finessed and pretty wines that reflects the old school and natural approach he employs here. The lovely and lightly earthy Rayos Uva Vino Tinto is a blend of classic Rioja varietals with mainly Tempranillo, but also Graciano and Garnacha from 15 to 20 year old vines grown on alluvial soils, with mostly sand, gravel and a bit of ancient clay in Rioja Baja, it is meant to be a village wine with little oak influence. The native ferment Rayos Uva sees a combination of stainless tank, old foudre and cement vats (for 6-8 moths), everything to express purity of form and delicacy and this 2016 is brilliantly fresh, vibrant and with elegant texture, it may be light when compared to most Rioja it surprises for it’s layers and length with sweet black cherry, truffle and mixed floral tones as well as dusty spices, raspberry, tart currant, anise and Turkish fig. This Rioja offers a solid value and gives an impressive palate performance, this is a lot of wine for the price, keep your eyes out for Oliviere Riviere, imported by European Cellars (Eric Solomon) as this is going to be a winemaker to follow!